"The majority of the park remains pristine desert, very similar in appearance to the landscape seen by the first settlers and explorers. The Sierra Estrella range, or Star Mountains, was once within the Mexican border, and remained so until the Gadsden Purchase in 1853." We've camped in some rather unusual places and this is another one to add to that list. 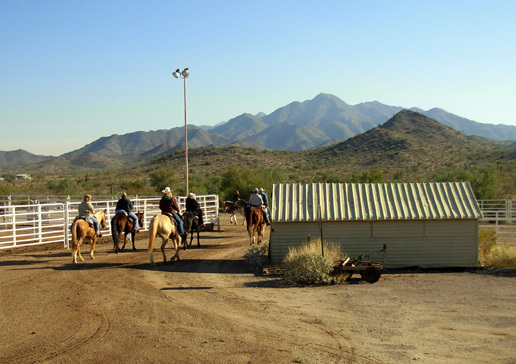 No, I don't mean Estrella Mountain Park itself but rather the particular "site" they offered us: behind the horse arena! Our camper is the one on the right. Unlike McDowell Mountain Park on the opposite (east) side of Phoenix, where we've enjoyed staying a couple of times previously, Estrella doesn't have a developed campground for the general public. There are about ten RV sites with full hook-ups but they are mostly occupied by park "hosts" in the winter and none were available to us for the two-plus weeks we wanted to stay. OK, so it is in a parking lot! We got over that pretty fast. Very cool. That was the only day on the trails that we saw more than one or two other people. We passed two large groups of equestrians on an 8-mile training run. 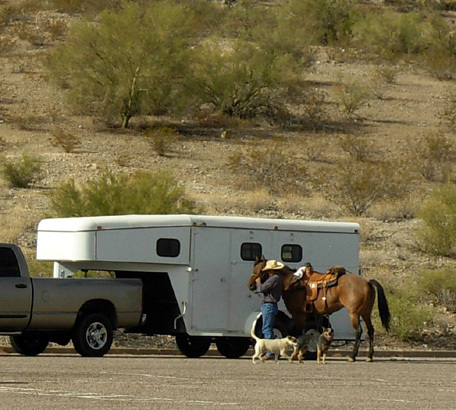 There were more than a dozen large horse trailers in the lower parking lot that morning. "Our" trailhead. See the faint rainbow behind the mountain in Rainbow Valley? We have been treated to brilliant sunsets (we usually sleep in and miss the sunrises), clear starry nights, and coyote choruses. AT 1 AM our first night here we were awakened by a pack of howling, singing coyotes that sounded like they were right outside the camper. They had a fascinating vocal range, but mostly high-pitched like a bunch of hungry, month-old puppies. Were they warning each other about The New Dog in Town? (That would be Cody.) Or were they warning Cody that this was their territory? He's usually good about barking or growling to alert us to various critters or people nearby, but he was totally quiet when the coyotes were close. Smart dog. Just act invisible and maybe they'll go away! 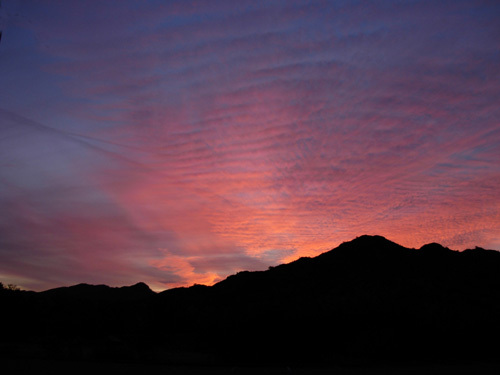 The most dramatic sunset was on December 12, when it appeared the mountains were on fire. Other advantages of staying at Estrella: we have a shorter drive to a YMCA, laundromat, and the stores we like than when we stay at McDowell Park. And we are only ten miles from Nardini Manor, so we have been able to go help the Wrubliks get ready for ATY. We got all this for a good price, too; can't beat that. 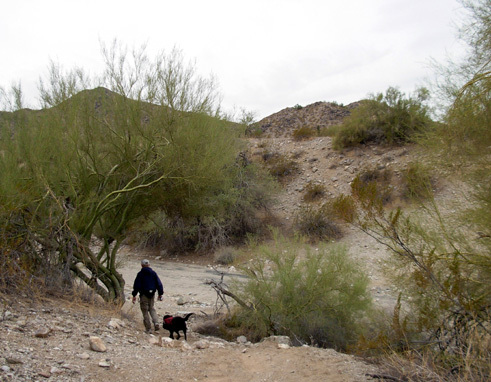 It isn't free like it is on national forest or BLM land, but it is $5 less per day than undeveloped sites in the other Maricopa County Regional Parks. We've been here for sixteen nights now. Jim and Cody dance through the rocks on the Toothaker Trail (may be how the trail got its name??). The main downside is that the trails aren't as run-able or ride-able as those at McDowell. Estrella has a lot of rocks. 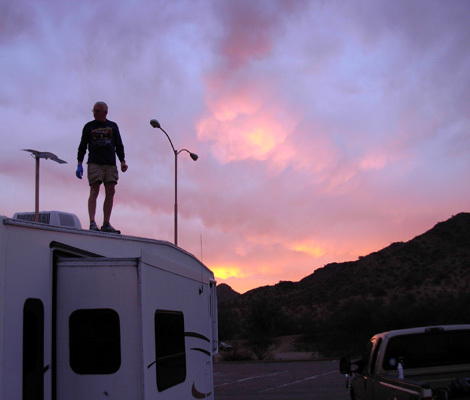 For only $5 more a night, we really do prefer the spacious camping sites and great trails at McDowell. So after ATY we'll probably go hang out there for a week or two instead of returning to Estrella. WHAT ELSE IS SPECIAL ABOUT ESTRELLA? 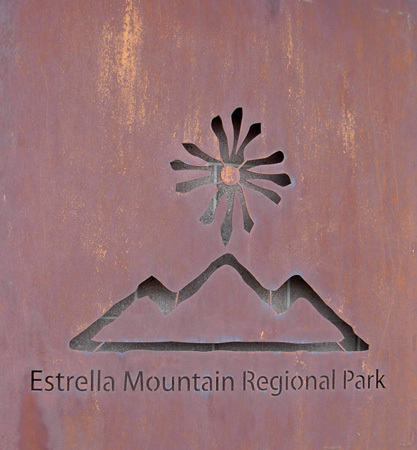 "Welcome to Estrella Mountain Regional Park. 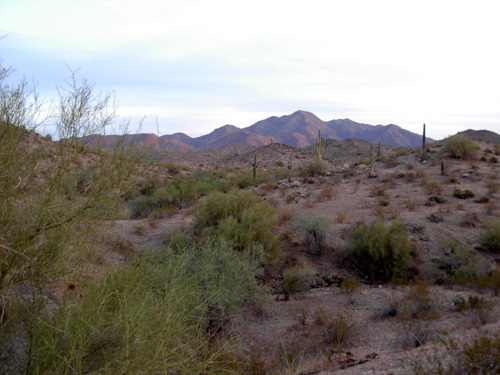 These 19,840 acres of desert and mountains became the first regional park in the Maricopa County Park System in 1954. 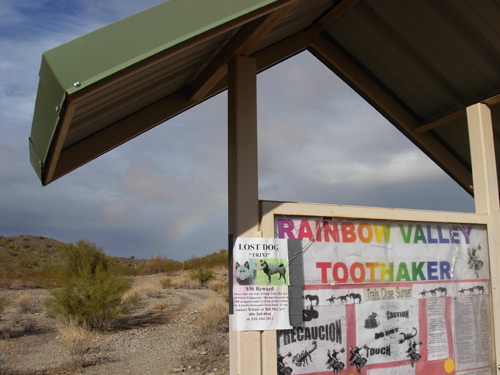 Located near the meeting of the Gila and Agua Fria Rivers in the southwest Valley, the park includes a large wetland, or riparian, area. The majority of the park remains pristine desert, very similar in appearance to the landscape seen by the first settlers and explorers. The Sierra Estrella range, or Star Mountains, was once within the Mexican border, and remained so until the Gadsden Purchase in 1853." My curiosity got the better of me after seeing a conflicting date on the marker, above, which sits behind the bench at the Gila Trailhead. The parks department brochures also say 1853. 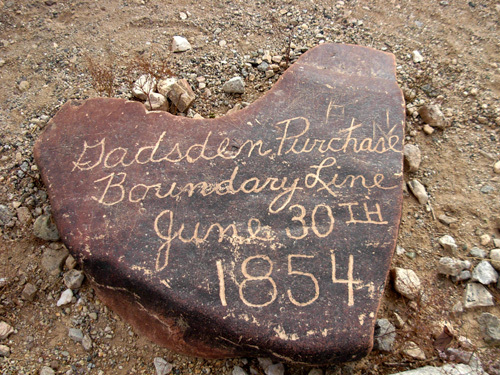 Just when was the Gadsden Purchase? I went to the ultimate source of information on the internet: Wikipedia! Just kidding. Here's a link to what should be reliable, a US Dept. of State web site, for those interested in more details of the treaty. It was signed by President Franklin Pierce in 1853 but not ratified by the US Senate and signed by Mexican President Santa Anna until 1854. Hence, the discrepancy. I enjoyed reading the history of the event (but still wonder why I didn't see June 30th specifically in the account). 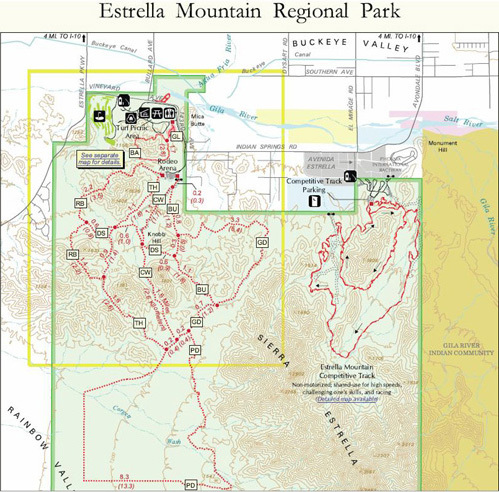 The Estrella web site continues, "Today, many amenities are available to visitors, including the only grass picnic area in the Maricopa County Park System." Now that last sentence gave me pause. After living in the very-wet-and-very-green eastern US for most of my life, it just reinforces the fact that the desert Southwest is in a whole 'nother Zip Code, so to speak. The only grass picnic area in the large metro Phoenix park system? Wow. 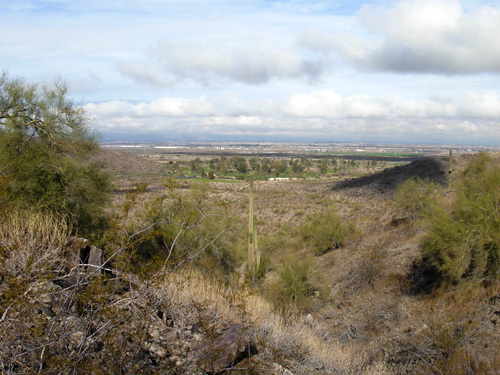 View of very green golf course adjacent to Estrella Park, as seen from the Rainbow Trail. I don't know why that surprises me, though. "Going green" takes on new meaning in the desert. It takes a lot of dedication -- and irrigation -- to have a grassy yard or golf course around here. That's not exactly "going green" in the sense of political or ecological correctness, but we understand the urge to walk on soft grass versus the sand and rocks that are so pervasive here. In our high-desert suburban Billings, Montana yard we went to great effort and expense to build an irrigation system, lay sod, and maintain a little patch of green grass. In retrospect, and on several levels, we later wished we had just placed rock "mulch" out there; it would have been so much simpler. Fighting Mother Nature is usually a losing proposition. 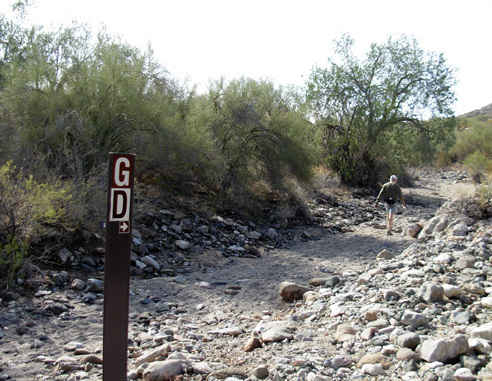 Right now, however, in late December you can find grassy picnic areas, campground sites, and hillsides along the trails at all eleven of the regional parks in Maricopa County and probably everywhere else in the Valley of the Sun -- without artificial irrigation. Thin or thick, the bright green blades of grass and other grass-like ground covers are suddenly one or two inches high in some places. They aren't confined just to shady areas under palo verde trees; they are everywhere. 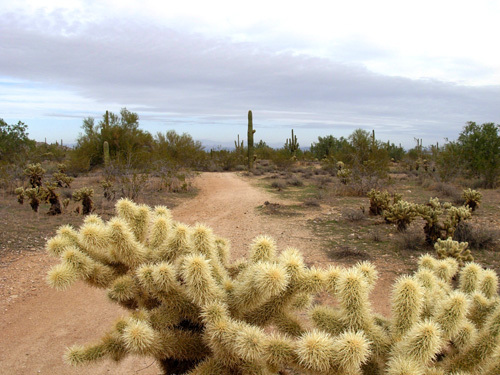 The park isn't lush like east of the Mississippi is lush, but it's lush by Sonoran Desert standards. And it's nice to have some green in December. What happened? Has spring sprung in the desert? Not yet. Since our arrival on December 10 the area has been doused at least four times with copious amounts of rain, relatively speaking, amounting to three or four inches in some parts of the Valley. That is nearly half the annual average rainfall of 7 to 8 inches. December is usually the wettest month here. One local government site indicates the average December rainfall at the airport is one inch. ONE INCH, and that's the wettest month. If you live near either coast or in the Midwest, you're probably shaking your head and wondering how on earth anything grows out here. You'd be surprised how many plants and animals have adapted to this harsh, arid environment and grow quite well, thank you. If you're interested in reading more about this remarkable ecosystem, I wrote two entries about local desert flora and fauna back in January (both dated the 20th, at the links above). I joked to Jim that if any more rain falls, they're gonna have to start mowing the desert! Those thirsty little blades of grass pop up from out of nowhere and grow very quickly when offered a long drink. I love watching the transformation. The rain also brings out the pungent odor of the creosote shrubs across the parking lot; it's not unpleasant, just very different than any other scent. I'll write more in a pre-race ATY entry about the problems the rain is causing on the track at Nardini Manor. Sometimes more isn't necessarily better. A WHITE CHRISTMAS IN PHOENIX?? While I'm on the subject of weather . . . The storms that dumped all that rain in the Valley recently have also dumped equally-copious amounts of snow in the high country, to the delight of skiers and other snow-lovers. I'm not talking only about the mountains ranging up to 12,000 feet in the Flagstaff-Grand Canyon area north of Phoenix, I'm talking about elevations as low as 3,000 feet -- the height of many mountain tops surrounding the Valley -- and even northern Phoenix 'burbs lower than that, like Cave Creek and Carefree. View of part of the Sierra Estrella Range from the Toothaker Trail. With elevations to 4,354 feet, some snow is likely during the winter. I realize it's winter now; the solstice was just three days ago. But snow in the Phoenix area?? We haven't seen any snow at Estrella Park in the far southwest metro area but we saw it on the local TV news reports (therefore it must be true, right?). 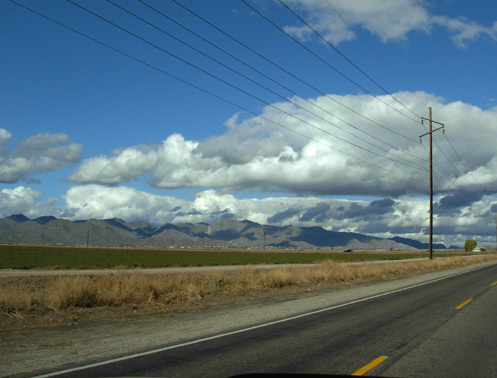 Not only have the mountainous regions north and east of here gotten repeatedly slammed with snowstorm after snowstorm this month, bitter cold air and a few flakes of snow briefly touched the north side of Phoenix just in time for the holiday week. Local temperatures are now predicted to dip below 30 degrees for a couple nights. Brrr. Other southern cities like Houston and New Orleans even got rare snow a couple weeks ago. It's been an unusual December. Just as in Texas, we've run into more below-normal than above-normal temperatures here in the Phoenix area. So much for avoiding the "ravages of winter" in Virginia! We really haven't paid much attention to what's going on there since we left. Arizona banks on its sunshine to draw visitors and residents. We aren't complaining, though. I'm guessing it's still sunnier and warmer in Phoenix than Roanoke. Our water sources (outdoor faucets) and camper pipes haven't frozen, so our supply of water has been uninterrupted. We have plenty of electric and/or propane heat to stay warm on chilly desert nights. The temperatures here during the days that are sunny (which are the majority of the time) are very pleasant, in the 55-65� F. range. The average high for this time of year is about 67� F.
We can't complain. Life is good, even when it rains. Nor have we been cross-training here on Jim's mountain bike. We aren't skilled enough (nor do we have enough body padding) to enjoy the bumpy ride on either the trails or competitive track (which is also single-track trail). I did ride a few miles one day down to the new nature center and back on paved roads, but it would have been reckless of me to try riding on the single-track trails around here right before an important race. 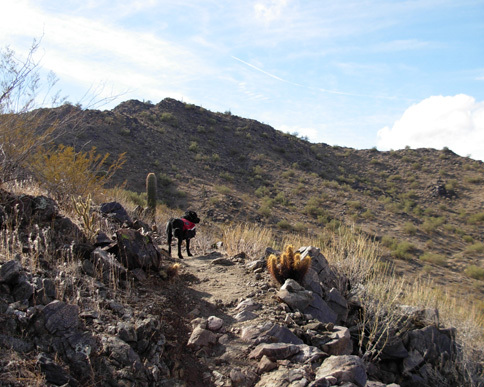 So in that regard, it's good that Estrella's trails are fairly rough. If we'd been at McDowell Park the last two weeks, we probably would have run and ridden too much on its dandy trails and gotten all worn out for ATY. Better to savor those trails after the race. 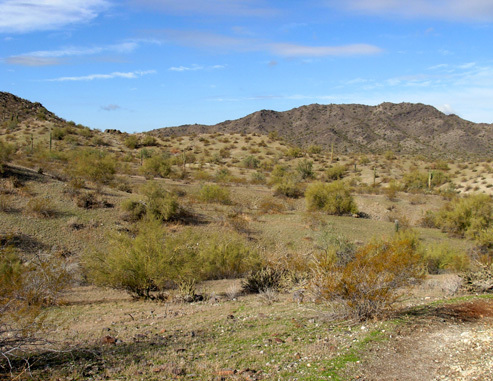 Still, I managed to take dozens of photos of most of the 40+ miles of trails at Estrella. Since there are so many interesting views, I'll put a selected group of them on our Picasa photo-sharing site and only a few here. Below is a condensed map of the park; you can see the trails better in the pdf file at this link. We have explored most of the trails in the network in the upper left quadrant. There are numerous options here, with varying distances depending on how you combine the loops or do out-and-back runs, walks, or rides. None are flat; they all involve hills, again to varying degrees. All have great views of the mountains and/or valleys. Trail surfaces range from well-groomed (the short Gila Loop, where we practiced our run-walk strategies for ATY once) to gnarly (ridges of the Rainbow Trail. e.g.). Most of the trails are single-track. A mile of the Coldwater Trail is a service road with soft gravel that's difficult to run or ride. We were surprised to find a mile or more of the Gadsden Trail goes through soft sand and rocks through a wash; that's not a section we ever want to try to run again and I can't imagine negotiating through so much deep, soft sand on a bike. 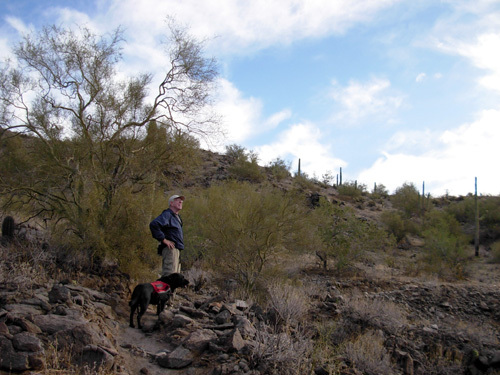 Jim negotiates a rocky section of wash on the Gadsden Trail; other parts have deep sand. 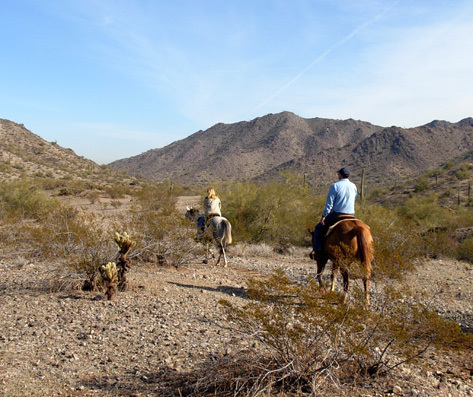 Most of the trails are shared use for hiking, cycling, and horse riding. Only about three miles of about thirty in this network are restricted to foot traffic only. In two weeks we've seen more equestrians than runners or hikers using the trails. We haven't run into any cyclists, even on the competitive track. That may well be because of all the rocks! That's the main reason neither of us has ridden trails here. 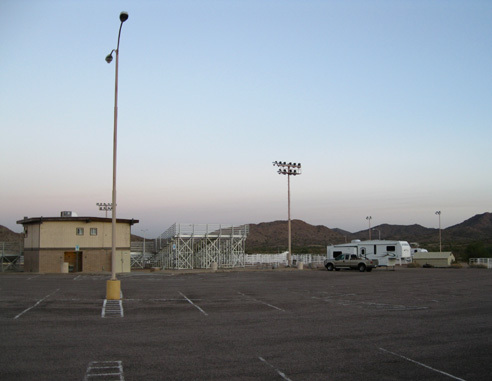 You can access other detailed park maps here, such as for the separate network of trails at the competitive track (located adjacent to the very popular Phoenix International Raceway, if the massive parking lots are any indication of how many car racing fans attend events there). 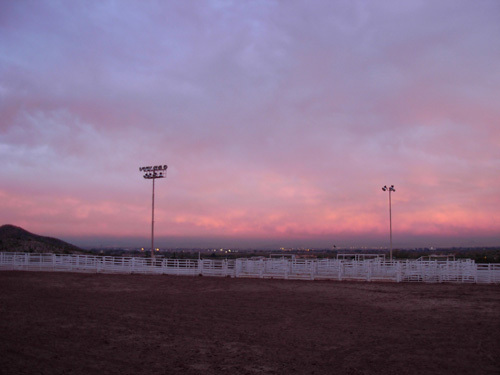 As at McDowell Park, the competitive track is for "high speeds, challenging one's skills, and racing." As the park maps say, "Use trails elsewhere in the park for leisurely traveling." We had all 13.3 miles at the competitive track to ourselves on a cloudy Monday afternoon so we didn't worry about going fast. We couldn't. There were too many rocks and steep washes to negotiate. Besides, we had a race coming up and we didn't want to sprain our ankles. The western side of the competitive track crosses several deep washes. Like the other parks in the regional system, Estrella has a full schedule of ranger-led programs and activities for the whole family. There were several activities I considered but we ended up being too busy with other things. We'll have to catch an organized full-moon hike another time; it was too cloudy to entice us out the door the evening the ranger led that hike. Ironically, it cleared up by the time the group returned to our trailhead. One Sunday we decided to drive to two of the other regional parks in western Maricopa County to check out their camping facilities and get maps of their trails. 1. 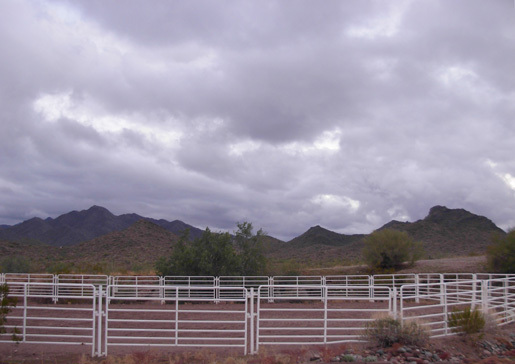 WHITE TANK MOUNTAIN is the next closest regional park with campsites to Nardini Manor. 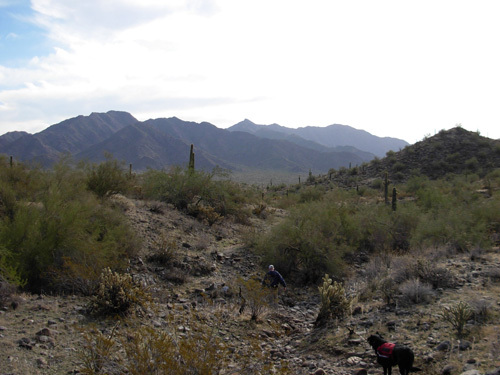 It is the largest regional park of the eleven in the Maricopa County system and has some of the most rugged mountains within its boundaries. Peaks rise over 4,000 feet from their base. "Tanks" are formed when flash floodwaters pour off the cliffs into the canyons, scouring our depressions in the white granite rock. We didn't traipse much of the 27 miles of shared-use trails or the 9.3 miles of competitive track on this trip, just half a mile of the track after hearing a foot race is held here each year. I want to go back there to explore trails that lead to some of the eleven Hohokum Indian sites, occupied from about 500-1100 A.D., and more recent Yavapai Indian settlements. Ancient tribes left hundreds of figures and symbols on the rock faces of the White Tank Mountains; some od the petroglyphs are estimated to be 10,000 years old. 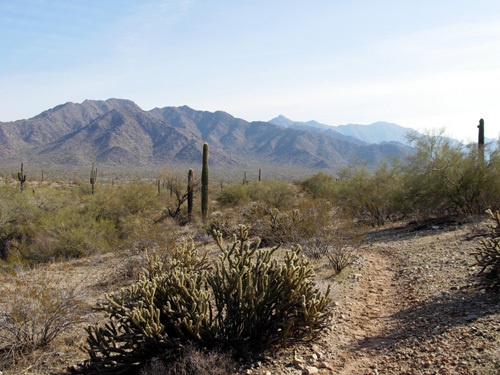 Trails range from an easy half-mile barrier-free trail to steep, rugged backcountry trails where bikes and horses are discouraged (but not prohibited) and hikers are urged to use extreme caution. Rodger Wrublik does some of his Hardrock training here, so I'm guessing there's plenty of elevation gain and loss. I don't know how technical the trails are. Maybe we'll find out next time! Typical Cody-the-Lab pose, with a stick in his mouth. He's waiting for one of us to throw it again. We'd considering camping here a while before an ATY race if we couldn't get our arena site at Estrella. However, all family camping at White Tank is "undeveloped." For the same price we're paying at Estrella for water and electric hookups, we'd get NO hookups at White Tank but have a "real" camp site space with a table, grill, and water spigot somewhere down the road. 2. 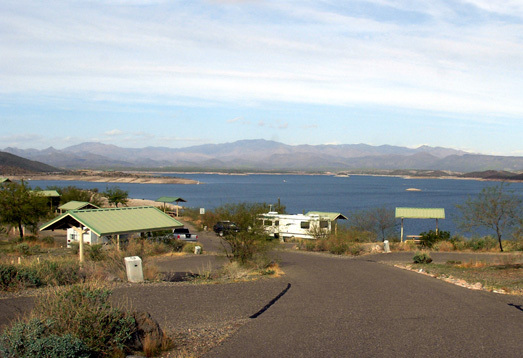 Next we drove quite a ways north to LAKE PLEASANT REGIONAL PARK, a very scenic water recreation area with several developed campsite areas. Many of the sites overlook the large lake, which is formed behind Waddell Dam. Some sites are full-service, some have just water and electric. All are packed in closer than the sites at McDowell Mountain Park. You can even camp in a tent or RV down by the lakeshore if you want more room and like to dry camp ("boondock"). 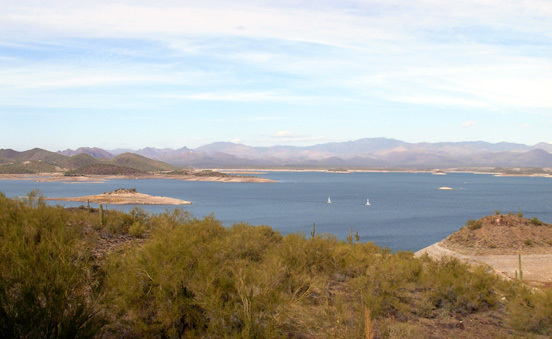 The downsides for us to staying at Lake Pleasant are the lack of trails and the distance to stores, a laundry, a YMCA, etc. It's quite beautiful, however, and the prime camp sites don't sit empty very long. This is a pleasant destination if you're more into water sports than running, hiking, or cycling. Today we're moving over to Nardini Manor's parking area so we can help Rodger for three more days before the Across the Years race begins. The next several entries will be about the race. I'm faced again with what I call the date dilemma, writing this and the next several journal entries days and weeks after they occurred. Do I date entries when they occur, when I start writing them, or when I upload them to the internet? In most cases since we created this web site in 2005, I've used the date closest to the actual occurrence of the topic. In this case, we got very busy helping with ATY preparations and other things before Christmas. Then we were busy running and recovering from the race. 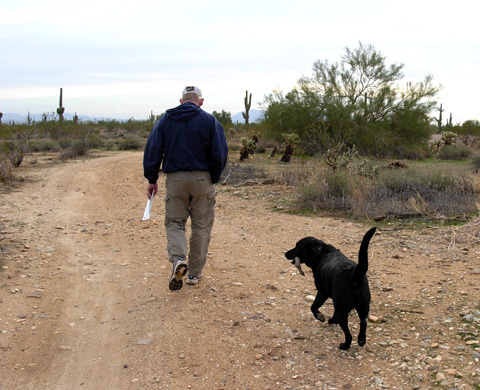 Then we moved twice, got caught up on things we neglected, resumed running and walking the beautiful trails at McDowell Mountain Regional Park, started reading the book Marley and Me -- you can see where this is going! I simply put the journal on the back burner, working on it as priorities allowed. It's more important to live life than to write about it! I started writing this entry on January 7 and uploaded it on January 10, 2009. I should be writing in a new 2009 journal by now! At least we are still in Arizona . . .